Valiant’s supernatural hero Shadowman has a legacy reaching to 4001 A.D.
Valiant Entertainment’s 4001 A.D. event rages on as we get another look at the legacy of one of the modern-day heroes and how it has survived so far into the future. This time, we see how the mantle of Shadowman exists, and what it means for the future. Written by Jody Houser (Faith) and Rafer Roberts (AA: Adventure of Archer and Armstrong) with art by Robert Gill (Book of Death), we see a very different side to the 4001 A.D. timeline. Gethsemane is a small city that survives in an almost symbiotic nature with Sanctuary, an abandoned outpost for the Deadside, filled with inhabitants from the dark natured place where Shadowman hails from. The human city has survived for so long because of Sanctuary, but at a price. Sacrifices are given to the Deadside in return for their help. But some humans decide to take a stand, but not for reasons as noble as they paint. Inside the Sanctuary lies monsters, loa and the being known as Shadowman, which is no man now but rather takes the form of a female host. The story shows that not every cause is noble, and not everyone is what they seem to be on the outside. Houser and Rafer create a tale very much grounded in its own mythology, but also with the ability to end up playing a role against Father in the 4001 A.D. mini-series. Gill’s artwork is detailed and muted, a perfect fit when you think of the Deadside and what lies within. 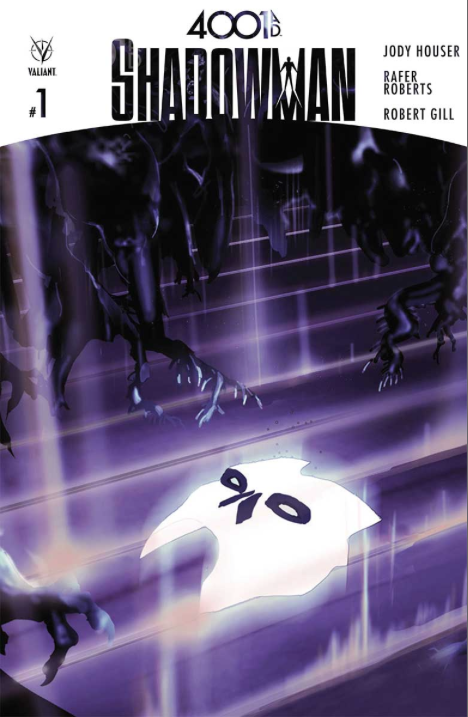 Seeing Shadowman release it’s power in the way it does while embroiled in battle is an amazing and terrifying site to behold, and Gill makes the beings in the battle look absolutely menacing. The book ends in a way that makes me think we may be revisiting the Deadside of 4001 A.D. very soon. These one shots that delve in the mythos of familiar Valiant heroes have all been outstanding, and Shadowman follows suite with a high quality, intriguing story. 4001 A.D. has not disappointed me yet, and with Shadowman, Valiant has another must read one shot for fans of the black and white-clad hero. Next Independence Day: Resurgence Review- Red, White, and Boom!